Usually there are 2 real estate companies involved in each sale - one representing the Buyer, the other representing the Seller. Each company has a sales representative working on their behalf. 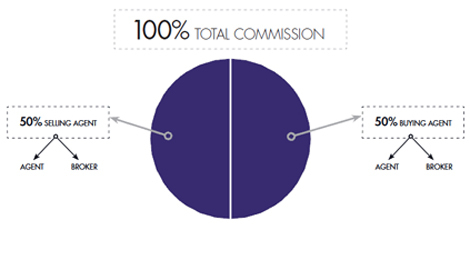 The commission is split 50/50 between each company and then again between company and salesrepresentative. Each listing indicates to the selling agent the percent of commission that will be paid if their client chooses to purchase that property.